Visit http://gamebrainpod.com for everything you could ever want to know about us. Some of the games discussed: Great Western Trail: Rails to the North Review, The Estates, Lorenzo Il Magnifico, Blood on the Clocktower, Lord of the Rings: Journeys in Middle Earth, On Mars, 18xx, 1879, Age of Steam, Arkham Horror LCG, Rhino Hero, Karuba, Gaia Project, Eclipse, Lords of Hellas, America the Board Game. Round 1, Turn 1: "Wingspan" with Tom and Welcome! 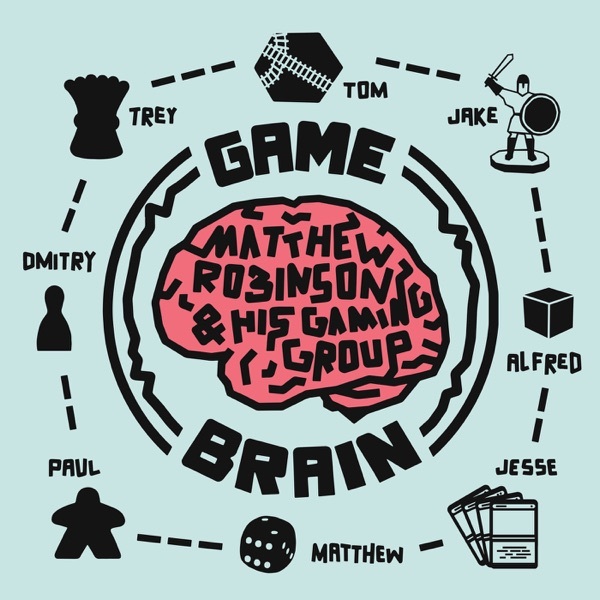 The very first episode of the Game Brain Podcast: A Board Game Podcast with Matthew Robinson and his Gaming Group. 27: 27: Round 1, Turn 1 With Your First Co-Host! 1:27:29: Co-Host Segment "Games that Time Forgot"